Especially with the advent of internet based ‘health and wellness’ sites and blogs, each month seems to bring to the fore a new miracle remedy. For around a year, now, people have been toting the health benefits of Guava leaf. But does it really work? Or is it just another hyped fad? From stopping hair-loss and promoting regrowth to eradicating acne and blackheads, smoothening out lines in the face to lowering ‘bad’ cholesterol, regulating blood sugar – even preventing cancer – if the benefits of guava leaves are real, this could, indeed, be a super remedy. For long, the health benefits of the pear shaped, light green, guava fruit have been known: loaded with vitamins A and C, lycopene, potassium, and dietary fiber, the old adage of ‘an apple a day keeps the doctor away,’ could easily have guava substituted in the place of apple. But what about the leaves? Is any of this supported by Science? Well, a 2007 paper by Suganya Tachakittirungrod, Siriporn Okonogi, , Sombat Chowwanapoonpohn of the Department of Pharmaceutical Sciences, Faculty of Pharmacy, Chiang Mai University, Thailand that was published in the journal Food Chemistry, studied the anti-oxidant properties of certain plants, including guava leaf. 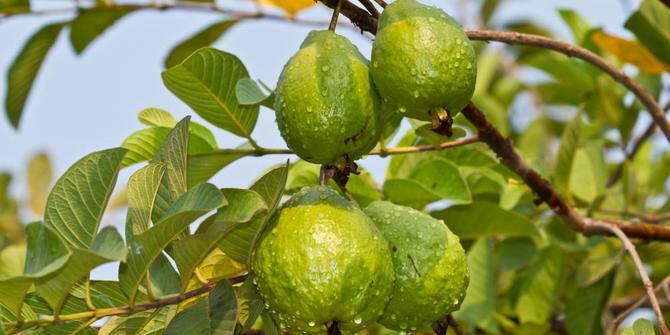 The authors found that, “ethanol extract from the leaves of guava (Psidium guajava) showed the highest antioxidant capacity with the TEAC value of 4.908 ± 0.050 mM/mg,” In other words, of the 24 plants studied, Guava leaf had the highest density of anti-oxidants! But lots of fruits contain anti-oxidants. Are there any other studies to support the specific therapeutic claims of the leaf? The answer is: yes. Claims of the gastrointestinal benefits of guava leave were investigated by Xavier Lozoyaa, et al, whose paper on it, Intestinal anti-spasmodic effect of a phytodrug of Psidium guajava folia in the treatment of acute diarrheic disease, was published in the Journal of Ethnopharmacology in 2002, concluded that guava leaf helped alleviate the symptoms of gastro enteric disease. The scientists engaged in a randomized, double-blinded, clinical study performed to evaluate the safety and efficacy of a phytodrug (QG-5®) developed from guava leaves, standardized in its content of quercetin and orally administered to a group of adult patients with acute diarrheic disease. Capsules containing 500 mg of the product were administered to 50 patients every 8 h during 3 days. Results obtained showed that the used guava product decreased the duration of abdominal pain in these patients. Another study in the same journal concluded that guava leaf helped reduce the frequency of coughs and colds as well as inhibited the growth of that irrepressible ‘hospital staff’ bacteria, Staphylococcus aureus. Based on the results of this study, instead of serving tea or coffee at hospitals, maybe they should be handing out cups of guava tea! One of the kickers in terms of research, may well have come in 2009 in the journal, Phytotherapy Research. A paper called Effect of guava (Psidium guajava Linn.) leaf soluble solids on glucose metabolism in type 2 diabetic rats by Szu-Chuan Shen, Fang-Chi Cheng, and Ning-Jung Wu. Their study concluded that “the results of acute and long-term feeding tests showed a significant reduction in the blood sugar level in diabetic rats fed with either the aqueous or ethanol extract of guava leaves (p < 0.05). Long-term administration of guava leaf extracts increased the plasma insulin level and glucose utilization in diabetic rats.” What about claims of preventing Cancer? The free-radical scavenging effects of phenolic anti-oxidants has been shown variously to prevent tumours both carcinogenic and otherwise. That aside, some studies on anti-mutagenesis and inhibition of certain types of cancer cells are promising. One study specifically examined the effect of aqueous guava leaf extract on one type of cancer cell: the 2007 study in the journal, Nutrition and Cancer, titled, Brain Derived Metastatic Prostate Cancer DU-145 Cells Are Effectively Inhibited In Vitro by Guava (Psidium gujava L.) Leaf Extracts, examined the effects of a water-based extract of guava leaves on the cancer cell, DU-145, which is responsible for a form of Prostate Cancer that has been known to metastasize. The authors found that the extract, “inhibited the cancer cell DU-145 in a dose- and time-dependent manner.” They concluded that an guava leaf may, therefore, be of use in the treatment and prevention of brain-derived metastatic cancers. So, while more study should be done before reaching a conclusion, early signs of guava leaf both being chemopreventive and chemotherapeutic in Cancer is promising. Other studies have found guava leave as acting as a potent anti-inflammatory (Soo-Youn Choi et al, Phytotherapy Research,Volume 22, Issue 8, pages 1030–1034, August 2008). The ant-glycation and blood sugar regulation properties as well as the enzymes present in the leaf would certainly stimulate weight-loss, though specific studies on this are yet to be done. So, the research does support the claim of guava leaf being one of those potential life-extending superfoods. So we suggest eating the fruit. And, boiling the 9 leaves in 5 cups of water until the water content is reduced by half, to prepare some therapeutic guava tea (best taken on an empty stomach). You may also crush the leaves with mortar and pestle and apply to acne and blackheads. The same added to water can be used as a potent face scrub, which purportedly helps prevent the appearance of fine lines on the skin. For anti-hairloss, take a handful of guava leaves and boil them in a liter of water for 20 minutes. Then, you need to leave the mixture to cool down at room temperature. You can use this guava leaves mixture like a tonic, applying it on your scalp and hair roots after you wash your hair. The mixture can also be massaged into the scalp in which case it should be left on for at least two hours before it is rinsed out. Some people put a shower cap on top to ensure the tonic doesn’t inadvertently get rubbed off. Relax, be well – and Go Guava!